Sometimes I can spend more time surfing for a good recipe, than the time it would take to make a chocolate soufflé. In search of the “Perfect Pie Crust,” I find the right website, enter my zip code, social security number, and the name of my first pet, only to get caught up reading about five different pie crust recipes that won’t pass muster and why. Thirty minutes later I am linked to the one I think I want. Alternatively, I could go to my recipe box, pull out the yolk and vinegar stained index card and make my grandmother’s pie crust recipe – the one that always received accolades from family and friends. That’s right, my recipe box. That’s where I kept the good recipes – way back when, in the 90’s. Don’t get me wrong, I love perusing cooking websites for new flavors and entertaining ideas. But to what end, if I am not writing down the good recipes? The purpose of the recipe box is to not only keep the good ones at my finger tips, but to preserve them for future generations – to tell my cooking story and provide the prologue for theirs. My maternal grandmother’s recipe box recently took up residence, on the kitchen counter next to mine. After she died, I fished it out of one of the many boxes containing her belongings. Saved! Inside this recipe box is her cooking history – revealing details about her social circle, the kinds of parties she hosted, favorite restaurants, diets, her favorite magazines and cookbooks (and four 3×5 reasons why I have such an aversion to Jello). I am reminded that so many good recipes – the keepers – are already in the box! I have made them and tasted them. Then, I went to the trouble of writing them down and filing them. They are not rated four-out-of-five stars, by people I don’t know. They come from my favorite cookbooks and chefs, a friend, or they were handed down from a generation before. They are written out neatly, with personal notes and helpful advice, received, and passed on with love. Thumbing through my grandmother’s recipe box and maintaining my own, I am sad to think I am likely the last generation of home cooks to keep a recipe box. In the same way I am sad that I am lax in maintaining updated photo albums. Where are my photos? They are in a holding pattern, on my computer, of course. I have come to treasure “the story” kept inside this kitchen relic. The recipe box serves as evidence of the learning, creativity, and satisfaction that takes place in my kitchen. I feel some pride in the worn cookbooks and the over stuffed recipe box. It is like anything I cherish – a photo, a letter, a child’s art work – that conjures up a good memory. Sometimes cooking and tasting these tried and true dishes can take me back in time. Even better they can transport someone I love home again. This simple pleasure is worth preserving. Following are four recipes, from my recipe box, worth passing on; and the story that goes with them. When my husband and I bought our first house, a neighbor greeted us with these muffins. I am quite sure she was trying to entice us to keep the dozens of unruly raspberry bushes invading the whole of our back yard. The recipe I kept, many of the bushes went. 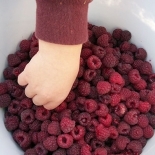 Fresh raspberries are a must for this recipe. Fold them in tenderly. When you break the muffin open you will see as much fruit as cake. Preheat your oven to 350. 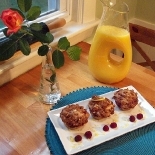 Line 12 muffin cups with liners or generously spray cooking oil. Sift flour, sugar, brown sugar, baking powder, salt, cinnamon, and nutmeg together. Make well in center. Place egg, melted butter and milk in well. Stir until ingredients are combined. 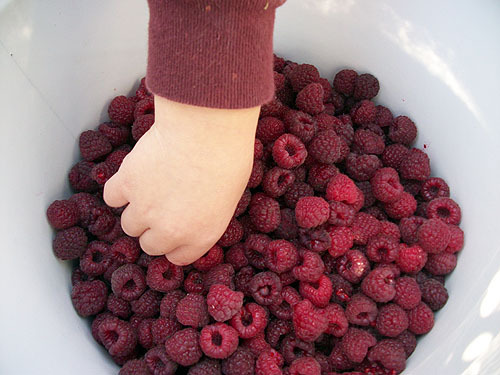 Gently fold in raspberries and lemon zest. 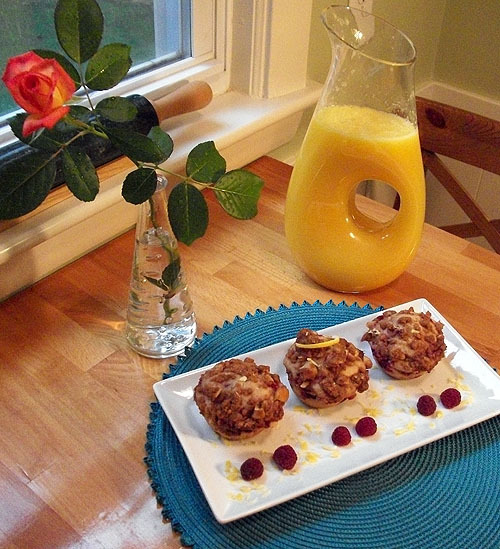 Fill each muffin cup ¾ full with batter. To make topping, combine nuts, brown sugar, flour, cinnamon, and lemon zest. Pour in melted butter and stir. Sprinkle over top of muffins. Bake 20-25 minutes. This recipe comes from my friend Jenn E. Jenn usually makes this soup in her slower cooker, but a heavy pot will do. Because Jenn is from Nebraska and I from California, we don’t have to uphold that traditional New England clam chowder is the best. In fact, we maintain that everything tastes better with bacon. Saute chopped bacon until beginning to brown, then add onion and continue until bacon is crisp. Drain fat. Put bacon and onion in slow cooker (or pot) with clams. Add potatoes, water, clam juice, salt and pepper. Cover and cook on high for 4 hours (if using a slow cooker) or on low heat if using a soup pot. In the final hour of cooking time, checking that the potatoes are tender, dissolve cornstarch in a bowl with one cup of the half and half. Add to soup, along with the remaining cup of cream and stir well. This recipe has always graced the table at my sister-in-laws plentiful 4th of July brunch. 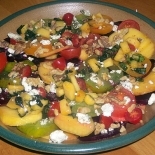 Her original recipe calls for peaches and tomatoes only, but I add fresh beets. The dressing brings all the flavors together. Really, it works! Whisk together 1/3 cup white balsamic vinegar; 1 garlic clove, minced; 2 Tbsp brown sugar; 2 Tbsp. olive oil; and 1/8 tsp. salt. Stir in 2 Tbsp. chopped fresh basil and one peeled and diced fresh peach. 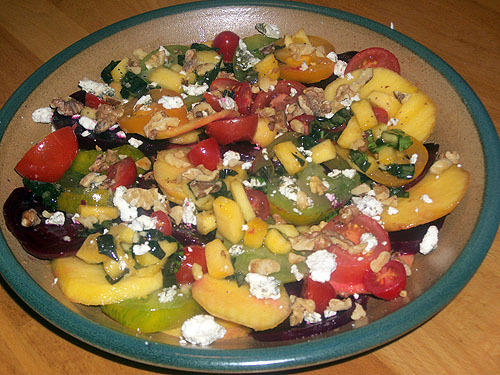 Spoon dressing over a variety of cut tomatoes, sliced peaches and sliced fresh cooked beets (approx. 2lbs. total); top with 3 oz. crumbled goat cheese and ½ cup coarsely chopped and toasted pecans or almonds. Sprinkle with freshly ground pepper. 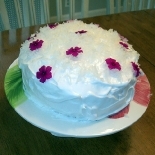 My first child’s 1st birthday cake was a coconut cake from Cooking Light magazine. Every couple of years CL seems to feature a new twist on a coconut cake, perhaps because it photographs so well. This version is the most requested birthday cake in my house. I confess that sometimes I take the “light” out of these recipes, especially if I consider an ingredient to be overly processed, in order to reach its low-fat status; or if I simply don’t have the lighter version in the house. Combine 2 ¼ cups flour, baking powder, and salt, stirring with a whisk. Place sugar and butter in a large bowl; beat with a mixer at medium speed until well blended (for about 5 minutes.) Add eggs, 1 at a time, beating well after each addition. Add flour mixture and milk alternately to sugar mixture, beginning and ending with flour mixture. Stir in vanilla. Pour batter into prepared pans. Sharply tap the pans once on countertop to remove air bubbles. Bake at 350 for 30 minutes or until wooden pick inserted in the center comes out clean. Cool in pans 10 minutes on wire racks, and remove from pans. Cool completely on wire racks. Place 1 cake layer on a plate; spread with 1 cup Fluffy Coconut Frosting. Sprinkle with 1/2 cup coconut. Top with remaining cake layer; spread remaining frosting over top and sides of cake. Sprinkle remaining 1/2 cup coconut over top of cake. Store cake loosely covered in refrigerator. Place egg whites, cream of tartar, and salt in a large bowl; beat with a mixer at high speed until stiff peaks form. Combine sugar and water in a saucepan; bring to a boil. Cook, without stirring, until candy thermometer registers 238 degrees. Pour hot sugar syrup in a thin stream over egg whites, beating at high speed. Stir in extracts.